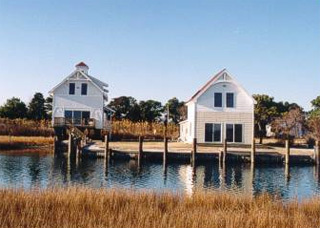 All Season Waterfront Homes have 3 bedrooms & 2 baths with 1700 sq. feet of living area. The only 2 homes located at the end of a country lane, in a quiet residential neighborhood. Deep water docking facilities if you have a boat. Canoe and life vests are furnished. Swimming pool privileges; large deck has breathtaking view of the water & marshland. Fishing and crabbing just outside your door. Fully furnished, central air/heat, color/cable T.V., VCR, washer/dryer, dishwasher, full kitchen. You furnish towels and sheets. NO PETS! Rents weekly June through September, 3 days from September to May.